A few months ago, I was working with a client who got herself into a pretty intense alien love bite/dark side of cupid relationship. The way in which she set herself up was through trying to “manifest her soul mate”. This is not the first case I’ve encountered wherein someone (who’s in desperate need/desire of “finding love”) engages in all kinds of “manifestation” techniques/rituals in order to attract a partner that, in the end, didn’t turn out at all like he/she had hoped it would, EVEN though – at the beginning – it felt and seemed like a “match made in heaven”. There are various reasons why people are potentially being set up with a Dark Side of Cupid relationship. It ties into occult hostile forces targting anyone who is on the verge of a greater awakening and/or has a specific mission profile/soul purpose to embody during this Time of Transition (and hence needs to be interfered with). This phenomenon doesn’t really relate to people who are fully plugged into the Matrix, for they don’t need to be interfered with to begin with, so these forces are always looking for the “way in” so as to get “permission” or “agreement“, for they need your consent (based on the law of free will/choice). Manifestation rituals can be the opening that provides them with that invitation. Sexual desire and romance (especially when feeling lonely and desperate for a partner) are the predominant weaknesses in most people which these occult adverse forces take advantage of in generating that “portal”. The various manifestation techniques of the New (C)Age Religion are tricky business. Many people unknowingly engage in all kinds of black magic rituals, and thus involuntarily set up “traps of agreement” (contracts) with negative entities who will gladly help them manifest their desires. The shadow aspect of ego also tends to feed off of getting what “it” wants. A trap of agreement grants occult hostile forces the permission to interfere/attach to the host, even if it is an unconscious act of permission. Ignorance is not a defense, nor is lack of knowledge regarding occult forces and occult laws. It’s the classic “Faustian pact with the devil”, even though most people who engage in these kind of manifestation rituals are not aware of it. …which can also grant negative forces permission to enter one’s field, posing/masquerading as positive forces that are here to help you with your manifestation-goals, only for you to realize at a later point (or not!) that you are being hijacked into living out a STS (Service to Self) path. All uncorrupted occult esoteric teachings have warned of this deception. “To say that all light is good is as if you said that all water is good – or even that all clear or transparent water is good: it would not be true. One must see what is the nature of the light or where it comes from or what is in it, before one can say that it is the true Light. the true discrimination has to come by growth of the psychic feeling and a purified mind and experience. The word ‘Appearances’ refers to the forms they take in order to rule the world, forms often false and always incarnating falsehood, sometimes pseudo-divine. The possibility of getting hijacked into a contract/agreement with negative entities is further heightened if you are trying to manifest desires which arise from the conditioned ego personality, particularly when it involves another person – a relationship/partner one wants to manifest or attract, especially when casting love spells or creating sigils. 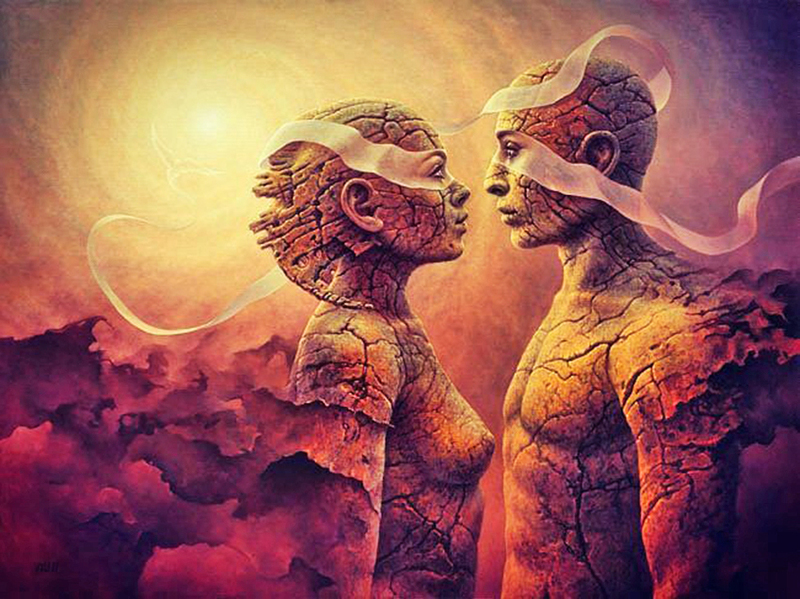 Most people want a love relationship with the “perfect partner”, their soul mate, Twin Flame (a very distorted New Age term), or whatever ideal they have in mind. But such union of a “higher nature” is NOT up to you. It’s about Divine Will and your soul mission/purpose/lessons. This “higher” union also happens effortlessly – IF it is truly meant to happen to begin with – in its own (divine) timing, which you have no control over either. Look at the people in your life – supportive friends or assisting forces (teachers, healers, etc.) 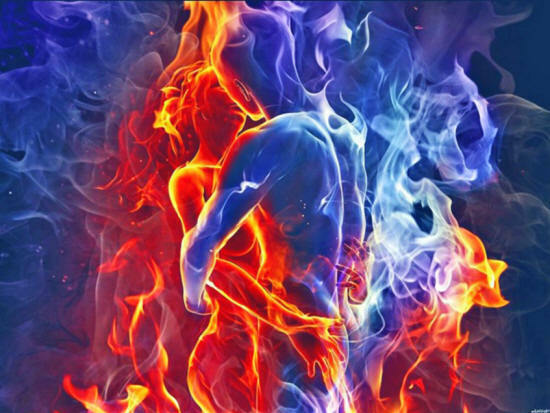 with whom you have no form of sexual/romantic connection – who came into your life just at the right time, effortlessly, without expectations and without any need on your part to manifest them. In the same way, a true love bond relationship will/can happen without any efforts involved to “make it happen”. There may be several other prior relationships (as well as longer periods of solitude) that we need to experience before we are ready to engage in a sacred/spiritual relationship on a “higher” level. It also depends on your own personal level of being, consciousness, soul-embodiment (all of which implies ongoing sincere self-work) and your individual soul path and lessons. This drive to “manifest” is actually stemming from disembodied ego and the wounded/conditioned personality (with all its insecurities and socially/culturally-conditioned wants, needs, and desires), but it is not arising from the true self, which only seeks union with the Divine, which is THE most important “relationship” to begin with. Twin Flame or Love Bite? from the esoteric concept of the “polar couple”. “The recurrent fantasy of, or search for, the ‘perfect partner’ is a strong signal from our psyche that we have work to do on ourselves. A relationship cannot be expected to fulfill all our needs; it only shows them to us and makes a modest contribution to their fulfillment. Could it be that I would not have learned what I needed to learn if I had met the perfect partner? The perfect partner is the mirage we see after crossing the desert of insufficient love. Mirages happen because we lack water – that is, we lack something we needed for a long time. They are normal, nothing to be ashamed of. We should notice them, take them as information about where our work lies, and then let them go. If we do this, we will come to the real oasis, nature’s gift to those who keep going, who were not stopped by the mirage. People who don’t have that divine connection (or don’t aspire to it via esoteric self-work) will most often look for it (unconsciously) in a partner. This is a potential set-up for misery and suffering (as is any external seeking of “happiness” and “fulfillment”), which can result in a Love Bite/Dark Side of Cupid love relationship. It also ties into getting addicted to romance or sexual hormone-generation (fuelled via jumping from relationship to relationship in order to keep experiencing the romantic/sexual high), which is not love. It’s ok to put one’s intention out there to be open for a genuine relationship, for example, or setting one’s sights on all kinds of other things which one wants to pursue and create. “Intention” is a very different energy than “manifesting” (especially via ritual or “will-full” doing). Intention leaves it up to the “universe” or Divine Will (Thy Will!) with zero exceptions, nor any ambition, need, craving, or lack/desperation frequencies behind it. There is no attachment whatsoever. That means that, even if one doesn’t get what one intended, it’s all fine and good. That’s where Faith and Trust comes in. But even intention is not necessarily needed. …the right people will come into your life, even a potential partner (if it’s in alignment with your soul path, for not everyone is here to experience that kind of relationship either, and there is nothing wrong with that!). These occurrences will be effortless in execution, but again, the ‘how, who, what, when’ is not really up to you – or better said, not up to who “you” think you are. I advise to be cautious with any kind of workshop and sales-people promising to help you,”attract/manifest your dream love/partner/relationship”. A lot of people who sign up for these kind of offerings are very desperate/wounded individuals, easily taken advantage of, and they can fall for all kinds of slickly-packaged pop-spiritual/new age marketing techniques. On a personal note, I wouldn’t trust any “spiritual” relationship coach/teacher who does not addresses – or is even not aware of – the reality surrounding those occult forces which are influencing humanity, especially when one is already engaged in sincere esoteric/spiritual self-work. “of, relating to, consisting of, or affecting the human spirit or soul as opposed to material or physical things” and “of, or relating to, supernatural beings or phenomena”. This implies being aware of non-physical hostile forces, and ultimately, the hyperdimensional matrix control system. This doesn’t imply that I discount basic relationship psychology/coaching; however, anyone who is sincerely engaged in the process of awakening and seeking truth will be inevitably confronted with these occult forces that are trying to interfere and vector you away from the path. Hence, as I’ve said before, relationships take on a whole new level for anyone who has taken the “red pill”, i.e. anyone who is honestly committed to seeking truth, self-work and cultural/social de-programming in order to transcend the Matrix mind control on The Path Towards Awakening. The hostile forces also attempt to interfere with any couple who have a specific mission/”higher” work to accomplish together. “The hostile Forces are Powers of Darkness who are in revolt against the Light and the Truth and want to keep this world under their rule in darkness and ignorance. Whenever anyone wants to reach the Truth, to realize the Divine, they stand in the way as much as possible. But what they are specially against is the work the Mother and myself are doing, to bring down the Light here into the earth and establish the Truth – that would mean their own expulsion. So they always try to destroy the work as a whole and to spoil the sadhana [spiritual work] of each sadhak [seeker]. Every complete/uncorrupted spiritual/esoteric teaching addresses what the work (towards awakening and spiritual self-realization) entails, but also describes the traps that lay therein, including the occult adverse forces that hinder this process so as to keep people plugged into the Matrix and attached to their lower nature (most often via ego-temptations such as “manifesting your desires”). Attacks/inferences tend to heighten throughout the awakening process, and other people (especially intimate partners) can act as portals for these forces to work through (as they manipulate through your own blind-spots and wounds as well). As stated previously, ignorance and lack of knowledge involving this “topic of all topics” is not a defense. Anyone who is sincere in his/her awakening process, and is seeking truth, both within and without, realizes at some point – usually after having gone through tribulations, initiations, tough lessons, trial and error (including purging the New Age pill that so many of us have swallowed at some point) – that in the end it’s not about trying to “attract” anything, nor about “manifesting” anything. …in order to increase Being (soul-embodiment), which then will consciously-link the individual more and more with one’s “higher self”/The Divine, thus enabling an automatically-generated innate ability to “create” and “attract” that which one truly wants and needs on an embodied soul-level (which also implies attracting ongoing lessons). This ties into the Soul Covenant’s role as a transducer for Divine Will, beyond the little “I” (ego-personality) and all of its mechanical programs, wishful thinking traps, and conditioned desires/needs/wants (and blame/self-pity fits if it doesn’t get what it wants) which so many people mistakenly-identify as representing their “true self”. This state of Being relates to immersing oneself in the Tao of life, becoming a vessel for Divine Will, being in this world but not of it, and living from within. One realizes on an embodied level that one’s desire for happiness, love, contentment, fulfillment, etc. does not depend on anything or anyone outside of oneself, for the “Kingdom of God” (Source Consciousness, not patriarchal religious programming) is only to be found within. Once we find and experience that deeper connection within, everything “falls into place” effortlessly – in its own divine timing – as it cannot be revealed any other way. Experiencing true creative power that’s in in alignment with Divine Will is an effortless event – ‘effortless’, in this context, however, doesn’t imply that all will just transpire smoothly, without conscious work, action or effort. It means that one has “become like water” and is able to face any challenge/lesson in life with grace, humility, patience, integrity and sincerity, taking full self-responsibility (without blame or victim consciousness reactivity), never losing the connection to the Divine. You intuitively flow in the river of life, guided from within. However, it’s vital to note that this process will conflict with any desires and goals you have/had which stem from ego/personality identification and social/cultural programming “insertions”. It also requires healing/letting go of any past hurts, grudges, resentments, shadow aspects, wounds, and traumas – which are being triggered/revealed even moreso now in these days of accelerated energetic activity. 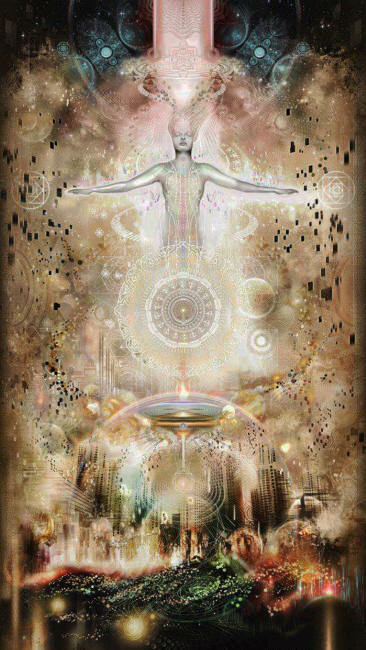 In other words, you need to clear your “vessel” in order for higher energies to be able to anchor themselves to your field, reconnecting you to who you truly are (activating your original blueprint/DNA). That process has profound effects on the outside world (which is not really “outside” or separated from “you”) with regards to a reality-creation process that is based upon your internal healing journey (and resulting increase in embodied “Being-ness” frequency). This is very different from what is being promoted these days within the distorted New Age idea of “reality creation” or “law of attraction”, where the focus is usually restricted to a series of positive mental creeds, daily affirmations and visualization techniques that take place within a externally-focused thought pattern of ‘wants’, and founded upon a fallacious idea that these thought-patterns take place in a vacuum, unaffected by the billions of other thought-patterns in the Earth’s ‘psychosphere’ of shared awareness. To be clear, there is nothing wrong with any of that (focusing on positive thoughts, making affirmations, and engaging in visualizations). The problem arises only if we do it forcefully, with expectations, and from a place of unconscious craving, resulting in suppression of the shadow; oftentimes, this fear of “negative” thoughts and emotions (or even of “negativity” that’s taking place in the world around us) – which is a primary program of YCYOR (You Create Your Own Reality) fallacies – is because we feel that, by looking at it, we will conjure up that “darkness” in our own lives. whatever you suppress and /or ignore within yourself will, at some point, be mirrored back at you, and manifest itself in your life, waiting to be confronted and healed, especially through intimate relationships. This a state of being wherein you don’t fight the world, or find yourself at odds with it (because you realize – on an embodied level – that the inner and outer are not separate, and all there is in this life are lessons for your personal soul evolution). Rather, you disconnect from any forced, will-full doing, and instead act from a grounded place of being, fully tuned-in to the present moment as you respond consciously to what life brings into your sphere of influence. Instead of making decisions from head-centric analysis, you become a conscious instrument/vessel for spirit/the divine to work through you. This is also based on a deep ‘knowing‘ and trust (in both life and in yourself), connected to your inner guidance which is grounded in your belly/pelvic floor. However, it’s a long road to reach that level of fully awakened Being-ness, and the path this maturation process takes is different for each of us. Regardless of individual circumstances, this journey is not without obstacles and opposition as we continuously learn (and re-learn) our lessons. From a partner-relationship standpoint, those lessons can seem very cruel, unjust, and lonely, but attempting to bypass them (especially via dark occult methods) will only prolong the misery and amplify the heartache. Next Next post: WE ARE THE PLAN!